I absolutely love to open new bottles of wine. It’s like going out with someone new… how balanced are they? How full-bodied? How… sweet? At the same time, it’s hard for me to try new wines at home. There are only two large drinkers in my family: myself and my mom. Thus, there’s a chance that the great wine I opened the night before will just sit for two, or three, or four days and turn into a sour vinegar. Such a waste when wine should be consumed right then and there! This is not just a problem I face at home. This was a very common phenomenon for me while I was at college (so long ago!). Sometimes I just felt like a glass of wine, but what to do with the other four (or three, depending on your point of view) glasses? It certainly didn’t help that my residents were waaaay underage. I was lucky enough to be in the company of one Alex B., a Bavarian by extraction who revels in drinking as much as, say, the next Bavarian, which is to say, A LOT. I have had nights when I’ve foolishly chugged one or two bottles of cheap wine in the effort to get as drunk as possible as quickly as possible. With Mr. B., I tend to drink large volumes of alcohol, but always good, delicious alcohol. Thus is the raison d’etre for “The Third Bottle” red from GustavoThrace. There are five “glasses” in a bottle–closer to four, if you’re honest. So far, eight glasses of wine. There are six people. There is probably that one person who drinks the equivalent of half a glass (I mean, come on… but this sort of thing still happens!). Then the “moderate” two or three drink a glass each. That means the two lushes have 2.25 glasses each. Sounds about right so far. The problem is that you’re not done with the main course. There needs to be more wine! But what do you bring out? Your $90.00 Napa cabernet? Your $65.00 Sea Smoke pinot noir? But this would be a waste. By now the taste buds are filled with spices and sauces and alcohol. 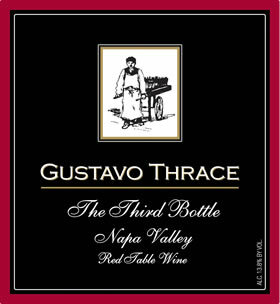 You need a pinch hitter–you need GustavoThrace’s “The Third Bottle.” This is EXACTLY what GustavoThrace had in mind when creating this wine: a delicious, quality, affordable wine that will provide the oomph when oomph is needed–without the “ouch” that might be expected out of one’s wallet. I opened the bottle I purchased on Saturday and drank tentatively. Colorado Wine Company reported that this wine was the fastest-selling wine in their history. For good reason. This is one great wine. The nose is a bit overpowered by alcohol–it was like smelling an alcohol swab, actually. However, the taste was quite mellow. Smooth as heck, with moderate tannins that hit only after a bit of swishing. Dusty fruit–plum, cherries. Jammy, even. Licorice. Light-bodied for a cabernet–or what I believe is a cabernet (no grapes are listed on its label). A wine I would just love drink by itself… three bottles at a time. And at the price, why not? $9.99, available at Colorado Wine Company (Eagle Rock, CA). * I’m wondering if anyone else has experienced this phenomenon. After drinking a lot, I find that my face and scalp get a bit numb. It feels good to rub my face and hair at that point… maybe on account of the thinning of my blood. Actually, I’m rubbing my face as I type–well, in between phrases. I had one or two (or three) glasses to drink after work! That is so weird, before you even added the P.S. I was thinking I was the only one who seemed to rub their face a lot when drunk. I always rub my nose. Strange.